"Graduate Schools of Sahmyook University - the lights never go out at the research center here"
School of Graduate Studies, opened in 1981, fosters highly-skilled professionals, spiritually and intellectually, inwardly and outwardly. Master’s degrees are offered in Theology, Counseling Psychology, Social Welfare, Early Childhood Education, Pharmacy, Nursing, Physical Therapy, Environmental Horticulture, Food Life Industry, Public Health, Convergence Science, Addiction Science, Sports Science and Music. Doctoral programs are offered in Theology, Counseling Psychology, Social Welfare, Pharmacy, Nursing, Physical Therapy, Horticulture, Public Health and Addiction Science. Social Welfare, Pharmacy, Physical Therapy, Nursing, Horticulture, Public Health and Addiction Science departments offer both masters and doctoral degrees. The Graduate School was accredited by the Ministry of Education in 1988. 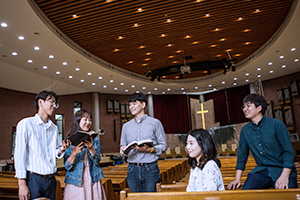 The graduate school, being true to the tradition and basic beliefs of the Adventist Church, provides holistic education of the mind, body, and spirit. Furthermore, in order to transform minds and change the world, the school is fully invested in spreading the Gospel at home and abroad. To this end, the school produces pastors, theologians, church leaders of the Adventist persuasion. In addition, we educate missionaries who spread the Biblical-Christian faith in all corners of the world through 1,000 Missionaries, PMM, and others. In answering to the great commission of Jesus, the Theology Graduate School offers Master of Divinity as a means of successfully accomplishing the call to spread the good news. Thank you for visiting Sahmyook University Business School. The School of Business, Sahmyook University, focuses on developing management principles and leadership for the management of profit and nonprofit organizations. The curriculum focuses on ways for organizations to adapt to the rapidly changing organizational environment and management of the 21st Century. In particular, the Graduate School is committed to fostering business managers with Christian principles. To this end, all curriculum and coursework are made sense from a Christian vantage point. Hence, all learning reflects the Christian worldview. Clinical Nursing major is offered at the Health and Welfare Graduate School at SU. The ultimate goal of nursing is the wellbeing at all levels of human existence: physical, social, psychological, and spiritual. The program enables students to cope with the changing times and environment in their professional pursuits as well as to realize a student’s full potential. The Health and Welfare Graduate School produces graduates with knowledge and skill levels tantamount to that of senior nursing practitioner, educators, managers, and researchers who contribute to the public health by exploring and using advanced nursing theory and practical knowledge.